Report: This paddle was support for a 12km charity swim from Luss to Lomond Shores. Late communication from the organisers suggested they only needed 1 kayaker and, given an atrocious forecast, a number of kayakers and open canoeists dropped out. Helensburgh at 8am was blowing force 4/5 and we confidently expected cancellation and a short training paddle for us. Luss, however, was surprisingly calm and 19 paddlers and 19 swimmers eventually set out at 10.15am. Progress was slow; the top swimmer swims at less than half the pace of a normal kayaker. However I think it is true to say we were all in complete admiration of the effort and determination of the swimmers; it is not a good way to travel! 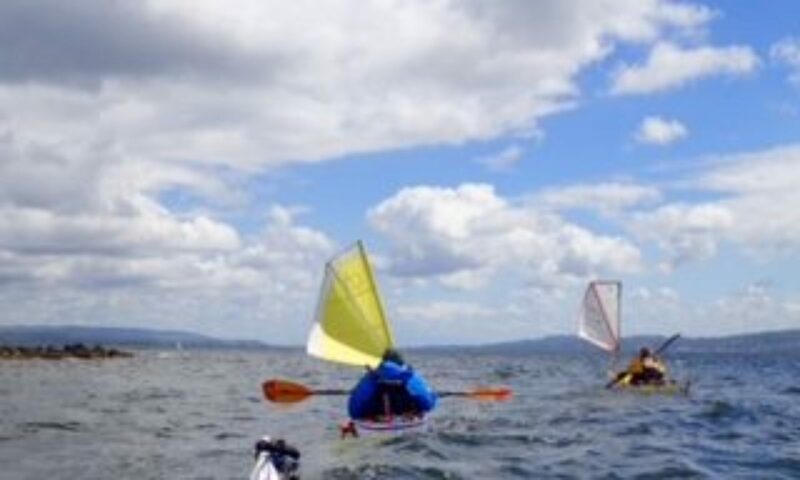 As we exited from the passage between the Inchtavannach and the mainland the wind became much more obvious and as we passed the golf club was starting to lift the paddles from the hands. By the time we reached the end of the golf course two of the lead kayaks had capsized, one of the teams withdrawn and the swim and paddle cancelled by the Safety team. To go with the force5/6 winds I should also mention periodic bouts of torrential rain. The Ribs then took the swimmers and one kayak driver (me) on a very wet and bumpy trip to Lomond Shores whilst the kayakers retreated back to the road at the golf course entrance where they were eventually picked up and transported onwards. Lessons: None really. Safety was never compromised and we all seemed to enjoy the experience, even when cold and very wet.